A dragon sleeps in Mount Fuji. 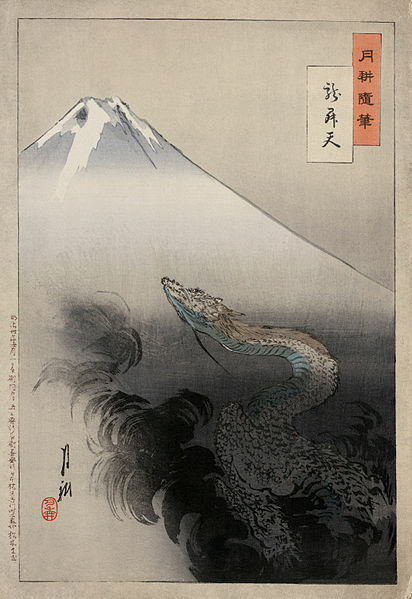 Ogata Gekko's Views of Mt. Fuji (1897). Image Source: Wiki. 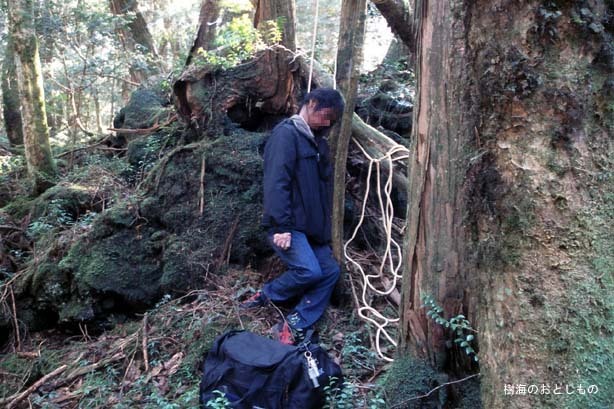 Some may have already heard of the Aokigahara Forest (青木ヶ原), the so-called Sea of Trees (樹海) that sleeps at the foot of Mount Fuji in Japan, an area known as well for its volcanic caves. 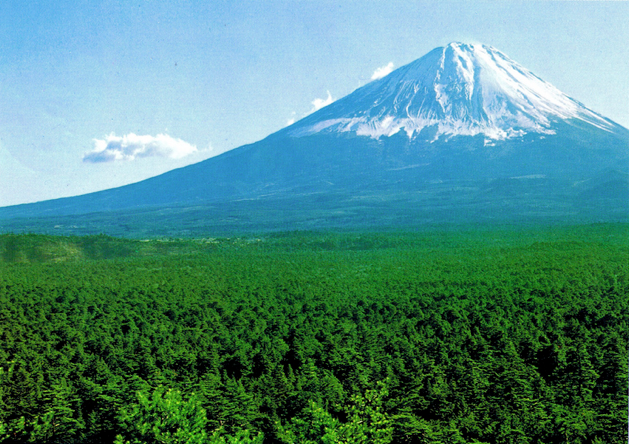 Mount Fuji and the forest that sleeps at its foot. Image Source: Tout & Rien. This wood is a notorious magnet site for suicides, and the forest floor is scattered with skeletons and dead bodies (for disturbing examples - do not click if you do not want to see troubling images - go here, here, here and here). The authorities clear bodies away with the help of volunteers every year. 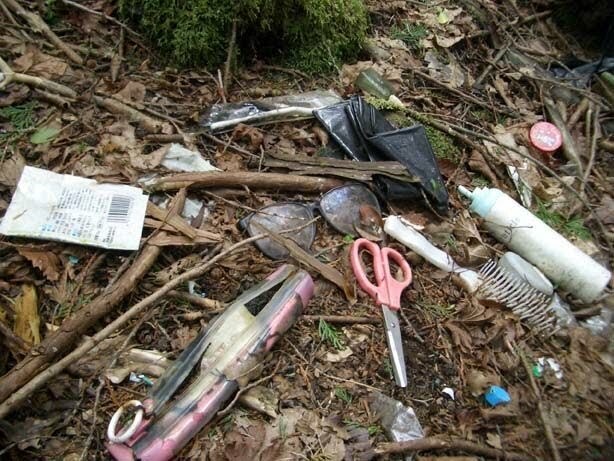 Personal articles of suicides, along with bodily remains, litter the forest. Image Source: Sonya. According to Sandy Amazeen, the forest is known as the world's second most popular suicide location after San Francisco's Golden Gate Bridge. Roughly 30 people die there by their own hands annually, with a high of 105 people in 2003 (and still rising); most of them are men. Many kill themselves out of shame associated with unemployment or other financial problems. Experts fear that the global economic downturn, combined with the financial and emotional impact of the 2011 earthquake and nuclear disaster in Japan, will result in an increase in suicides. The authorities have erected signs pleading with those grappling with utter despair to stop, turn back, and reconsider that there is hope - outside the forest. 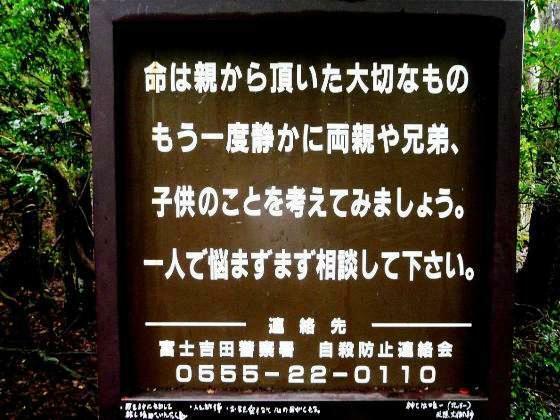 Forest sign, Aokigahara. Image Source: Yahoo. The sinister aspect of the forest could be associated with the incredibly destructive potential of the mountain itself, a massive volcano which sits at the junction of three huge geological plates. Situated only 62 miles southwest of Tokyo, it last erupted in 1707. The mountain's threat has long been symbolized by a sleeping dragon, whose smoke rises up to the sky. 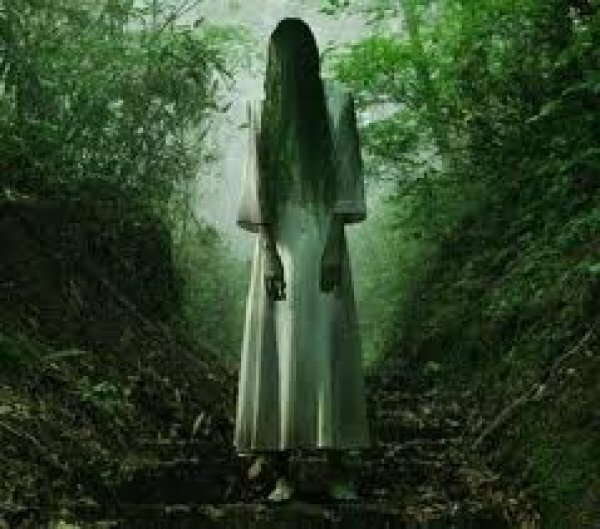 A classic Yūrei, or Japanese ghost. Image Source: Benta5. The surrounding forest is reputed to be haunted by demons from Japanese mythology, along with monsters, ghosts and goblins. It is said to be a spiritual No Man's Land: "a purgatory for Yūrei, the unsettled ghosts of Japan who have been torn unnaturally soon from their lives and who howl their suffering on the winds." The trees' roots are pushed up from the rocky volcanic bed, which make the trees look as though they are about to walk away. This spiritual upheaval has long been linked to economic suffering: in the 19th century, poor families abandoned the very young and the very old whom they could not afford to keep in the forest. The forest is 3,000 hectares (11 square miles) in size, normally a distance that could be crossed in a few hours. But the bush is so dense that people do not get very far; they lose their sense of direction almost immediately. There are holes that drop down into volcanic cave pits everywhere in the landscape; if you stray from the path, you can suddenly fall into one of these and never escape. Hikers complain immediately upon entering the wood of an oppressive atmosphere, of a presence, of a sense of being watched. They also feel that the trees are moving their branches to shut out the sun. It is rumoured that the iron in the volcanic rocky ground creates magnetic waves that cause compasses and electronic devices to malfunction, making it even easier to get lost in the forest. But this has been debunked: "A very popular myth states that the magnetic iron deposits underground cause compasses to malfunction and travelers to get lost in the forest. However this myth is largely false. Japan's Self Defence Force and the US Military regularly run training practices through portions of the forest, during which military grade lensatic compasses have been verified to function properly. Vehicles, GPS equipment, and other electronic devices function properly." Below, see a documentary following the forest caretaker, a sympathic and kindly geologist who tries to help unhappy people entering the wood. He adds some sanity to an otherwise silent, grisly setting. See also some curious Swedish film makers trying to make sense of the forest's mood as they research a documentary. Both documentaries suggest that the heart of the problem relates firstly to the peculiar landscape and fear associated with living next to a giant, incredibly dangerous (and sacred) volcano; and secondly, to the thriving metropolis just outside the forest's range, where the push to succeed and compete can create a perfect storm of urban pressures so critical that for some who fall on hard times, there is only one retreat. The forest easily becomes the boundary of the sleeping dragon's realm, a final earthly harbour in the black sea of the dead. 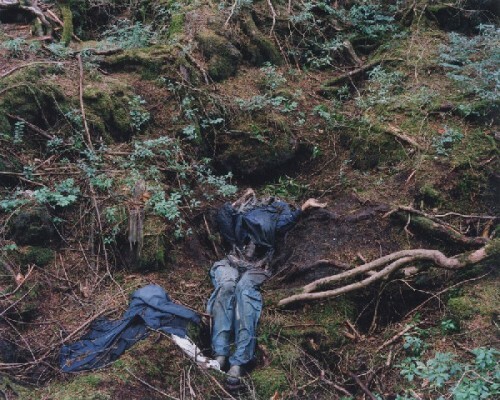 Both films confirm that the apparently mundane and friendly act of simply offering someone a helping hand under these conditions makes the sombre magic dissipate, so that the frightened and dispossessed who are drawn to Aokigahara wood can face the world of the living again. The Perfect Place, Part 1. Video Source: Youtube. The Perfect Place, Part 2. Video Source: Youtube. Fascinating post! 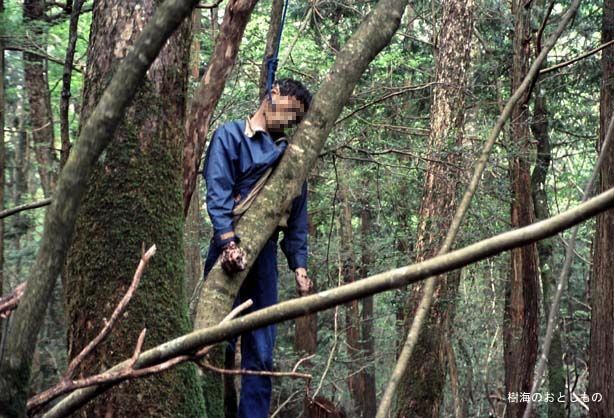 I'd heard of this suicide spot in the past but I never knew it was named "The Sea of Trees". Sounds so poetic... and I suppose it is, in a darkly gothic sort of way. More precisely, it is known as the Black Sea of Trees. What's most interesting, I guess, is that Mount Fuji is practically synonymous with the international image of Japan, and has been for at least a couple of centuries. It's one of the first things you think of. And at its foot lies a location which the people of the country have decided is the spiritual and symbolic and (I guess) 'psycho-social' centre of their heart of darkness. While there are haunted locations rumoured all over the world, I can't think of a similar place that is sort of a 'national' haunted park, as it were. The national bottomless pit. "Hikers complain..." Well, Hikers shouldn't GO there! DUH!